The resurgence of turn-based strategy games (thanks in no small part to the success of XCom) has taken a lot of people by surprise, with even Nintendo and Ubisoft joining forces to make Mario + Rabbids Kingdom Battle on the Switch. 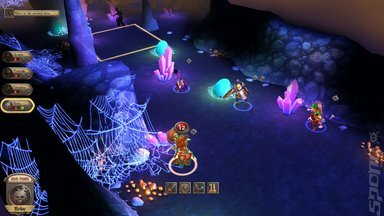 Fort Triumph builds on the success of these titles by creating a turn-based tactical RPG set in a fantasy realm. 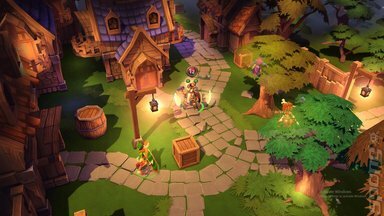 The major differentiator that Fort Triumph boasts is its reliance of environmental damage that can impact both the player characters and the enemies they are trying to dispose of. Set in the world of that has found itself off-kilter, it is up to the player to return balance to the realms and put an end to the ravages of the monsters that are emerging and the environmental disasters that are being unleashed. Magic, once a rarefied occurrence is now commonplace as the world splits open to reveal fissures - pure fonts of power that are warping the lands around them. Reality itself is now at breaking point and unless something is done soon, nothing will be left save a rift in time and space where a world once existed. The player takes control of a party of characters, all of whom have very distinct special abilities that when combined create a formidable challenge to the denizens of this broken world. Some characters are damage sponges that revel in attracting the attention of enemies, drawing them away from the squishy spell slingers and archers who like to dispose of their foes at range. Extra special actions can be invoked that typically cause a lot of damage to opponents or enhance fellow characters, depending on their tranche of abilities. Characters do level up during play and this opens up yet more abilities that typically build on the strengths of the particular party member. As hinted at in the beginning of this preview, environmental effects are extremely important in Fort Triumph. Player characters can and do set fire to things and this does have a massive impact on the surrounding objects, especially if they are flammable. If an archer fires a flaming arrow at a shaman who is currently engaged in combat with the paladin then not only will the shaman will be set on fire but also the grass around it, not to mention the paladin who is currently standing on said grass. Friendly fire is a feature in Fort Triumph and this did catch me out on a number of occasions when playing it at PAX West 2017. The visuals to Fort Triumph are not too dissimilar to the Blizzard style found in World of Warcraft and Hearthstone. The same glowing and polished stone are present as well as the low-polygon yet richly-detailed textures of the models, and it suits Fort Triumph well. With it being in pre-Alpha stage at the moment there is a still a lot of content to make along with the sound, which while impressive still needs a lot of work before it can be considered to be complete. I really enjoyed playing Fort Triumph as it brought back a lot of fond memories of the hours and hours I spent playing Shining Force games on my Mega Drive eons ago, only this time the level of strategy is far deeper and is much more rewarding as a result. Pulling of a combination move with a feint from the paladin in combination with the mage and the rogue is just so much fun, and I really can't wait for the release of Fort Triumph. 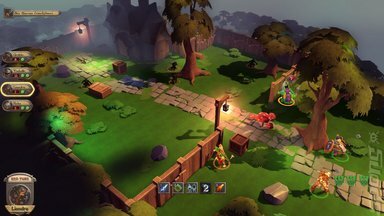 Fort Triumph is due for release in 2018 on Windows PC, Mac and Linux.